What if you have PPsync already installed? Here is a way to remove it! If you were waiting long for a new jailbreak, by this time, you would have definitely used the PanGu tool to jailbreak your iDevice. If you have not, no problem, just follow the simple steps mentioned on our guide. 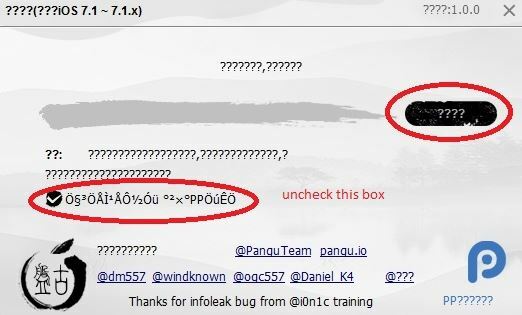 The Pangu tool, is totally in Chinese, so for some reason, there is a chance that you have missed a small step of un-ticking the checkbox while installation. You would ask me why this is very important, as the step does nothing bad but only brings in a new app, which comes handy to install paid apps for free! Unfortunately you are wrong. This app is said to programmed with less care and inturn crash many of the stock apps and cause system instability. Just disable the checkbox before clicking the Start Jailbreak button. For others, who have already installed the package and facing some system crashes. Find net.angelxwind.completeppsyncremover tweak from there and install it. Now you have PPsync removed from you phone! Say bye to frequent system crashes and enjoy Cydia!